2016 - What a great start! 1st time out on Eximius this year, 1st time out with new Sails, 1st time out with my Son Bob. 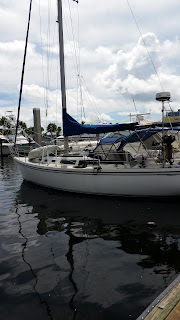 Great sail on the Ocean outside of Fort Lauderdale, headed out to the 3 mile limit, then sailed back. Hit the 7+ knots several times, sailed all the way back to the turning basin. then dropped sails and motored to Lake Sylvia to find it crowded! Lunch on the hook, then motored back up the new river to the slip. Awesome 1st sail of the year! Leaving a crowded Lake Sylvia. Under Attack! Again & I didn't win the lottery!